There’s something magical about summer celebrations—dining outdoors poolside and enjoying the long evenings; maybe gathering around a chimera on the patio as the nights start to become a little cooler. Food is always an essential part of any social gathering, and in summer that mostly involves grilling. The grill is one of the most versatile ways of cooking. It opens the possibilities for cooking on an open flame (delicious yummy flavors), on a hotplate or using a pan directly on the grill top. At the White House, grilling was a feature at many large informal events held during the summer months. In addition to the predictable favorites—steaks, burgers and franks—we would often set up a grill to prepare a variety of other foods such as vegetables and fish. Many people are daunted by the idea of grilling seafood and often point to a history of crumbling disasters. So, here’s the key! 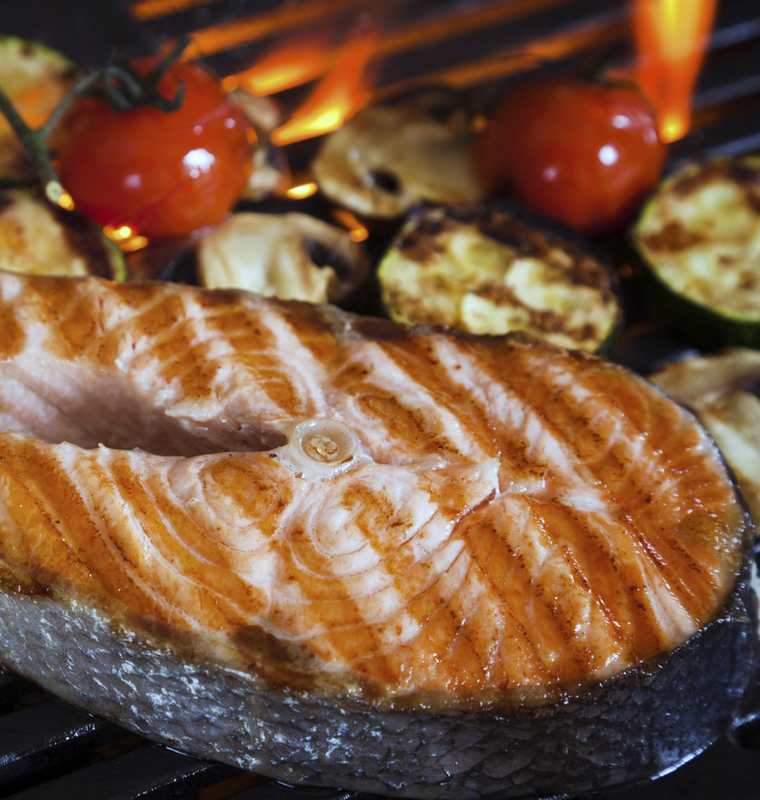 The secret to cooking great seafood on the grill is to make sure that it sears immediately! Because the moisture content is so high in seafood, it must react immediately and start forming that delicious crusty finish. Also, the fish will stick if it’s the grill is not hot enough or if there is any residue on the grill. So, make sure that the grill is really hot and the grill surface is very, very clean—and you’re well on the way to success! When you are planning your menu you can consider both shellfish and a variety of seasonal fishes. Lobster tail and shrimp are great favorites (love surf and turf). Grilled scallops are a delicious addition to any menu, but remember to make sure that they are really dry. Fish can be prepared three ways for grilling—whole, fillets or cut into steaks. Fish like snapper or cod are very flaky and difficult to grill successfully. But if you take a whole fish, such as a yellowtail snapper, that can work very well. Fish like sole—is best to forget when grilling so save them for the pan. Salmon, mahi-mahi, swordfish and tuna are all firm fish that do very well on the grill. The classic technique is to prepare the fish with a little olive oil, salt and pepper; you always want to oil the fish before putting it onto the grill. Canola or grapeseed oil make good alternatives—sometimes I blend them with a little olive oil to add to the flavor. If you are using a marinade to dress up the flavor, always make sure that you are using an oil-based product and allow a half an hour or so to marinate. A mix of olive oil, soy sauce and ginger adds a delicious flavor to tuna—and maybe sprinkle on a few sesame seeds as a garnish. A mild curry paste smeared across the fish before grilling adds a smoky flavor to the fish and makes an interesting variation. And—the finishing touch. I always leave the grill burning hot for a while after grilling to burn off any residue and then give a good clean with a wire brush. That way, you are all ready for the next grilling adventure. Cook well and eat well!